You need a project management solution that will make your workload easier and more productive for you and for everyone. Feng Office combines all the features necessary to be able to manage projects, customers, tasks, documents, communication and collaboration with co-workers, customers and vendors, billing, schedule meetings and events, all into one platform. The Overview shows a summary of your projects and clients status and their progress so that you can quickly know what is going on and take faster and better decisions. Speaking of which, the status can be calculated automatically based on completeness, dueness, estimation and pending factors which will then let you know which clients and projects require your immediate attention. Feng Office can be the best collaborate project management tool that keeps your team and clients working together, and helps you and your team stay connected and in control of all your Projects. Within the Dashboards you will be able to see more information about the status and progress of everything in a more granular way: seeing the due tasks, the estimated time vs worked time chart, the expenses chart, who has access to it, among other things. You can track every task, sub-task and milestone that is part of a project, process, service or activity. Tasks also include reminders and alerts whenever the due date is close and the activity is still pending. 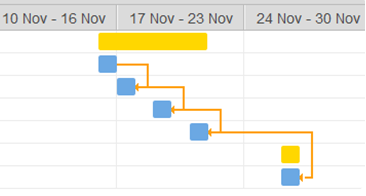 Besides the Tasks List, our Gantt Chart quickly shows you in a graphical way the exact status and progress of each of them, and that is not all! It lets you manipulate them so that you save time! How are you dealing with your organization processes? Have they been defined and written somewhere or do you have to rely on a specific colleague of yours? If so, what if this colleague is on a meeting, on holidays or anywhere else? Given those scenarios it would be great to have them in a system somehow, right? What if the system also lets you launch the processes so that everyone follows them step by step not to miss anything? Human errors would be drastically reduced and instead of remembering instructions, people could focus their attention on the actual content and process. Yet again, this is something you can achieve with Feng Office by simply picking the people responsible for the process and its start or due date, making this module one of the most popular and powerful ones. Are you tracking the time it takes you to complete an activity, task or project? Otherwise, how do you properly know their status and progress? Or how much to charge to your client or pay to a vendor? By tracking time you will also be able to estimate tasks and projects in a better way in the future, and thus to save time. What about your documents? Do you store them somewhere else and it takes you lots of time to retrieve them? Worry no more, in Feng Office you can store all of the clients, projects or any other kind of document you have, even Google Docs. 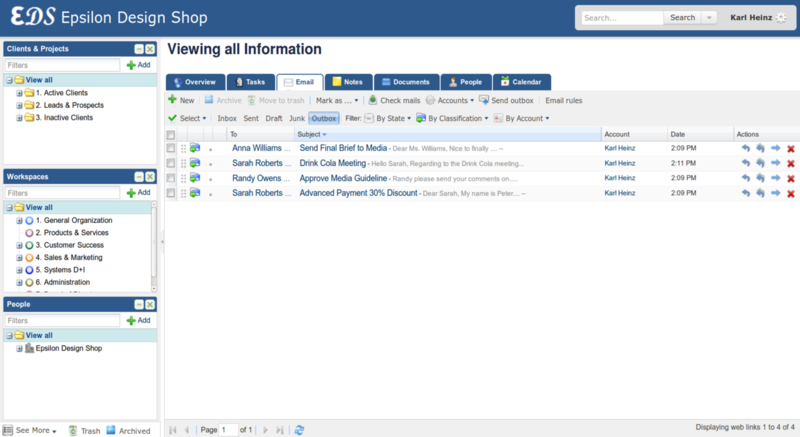 You can even create and edit certain documents within the system. Reports are very important and every organization needs them. Not just any report though but the ones YOU actually need. Even though Feng Office has default reports which are widely used by our adepts, you can always set up flexible and custom reports that will show you the information YOU require, and even export them into PDF or CSV files. The calendar allows scheduling your events and meetings agenda and also shows your tasks and milestones start dates and due dates. On top of that, it can be integrated with Google Calendar too! Ever thought of having all of your information integrated, including your emails classified within the right projects and clients so that you do not have to spend time looking for them in your regular email client? This can be achieved in a blink of an eye within Feng Office! What if you were able to keep track of your expenses such as materials, transportation and labour work so that you know how much you have exactly spent in a project or client and then compare it with the income? Other than keeping track of everything you would be able to tell the profit you have made. Were you aware that the average time spent in any organization looking for information is about 40% of their working time? By having everything in one system, being able to filter by a client, project or workspace, and a robust Search Engine like ours, you could instantly find what you are looking for. Besides managing your clients and projects, you may use Workspaces to manage the different departments of your company and restrict the access even further. Or you may as well use them as something else of course. Do you or your colleagues have to leave the workplace and would like to use a smartphone or tablet to access the data? No problem. Our mobile web application will let you access from any mobile device no matter what Operating System it has provided that it has an internet connection. Do you have post-it notes all over your desk? Well, you could also have them and other kind of notes integrated here so that you could have everything in one place. Would you not prefer to have all of your contacts classified accordingly and integrated with the rest of your information? We thought you would, so this is something you can also do with Feng Office. All the information managed through the system can be linked to each other making sure no element is forgotten or goes unnoticed, and so that you can quickly access whatever else is related to it. i.e. : a task to a document. Where are you storing your favourite websites? Or your clients websites? Or even your competitors websites? This is something you can also keep integrated with everything else. Do you keep track of your organization objectives? How do you do it? Would not it be best to have them integrated with the right projects, clients or departments in one single system, and then manage its progress? 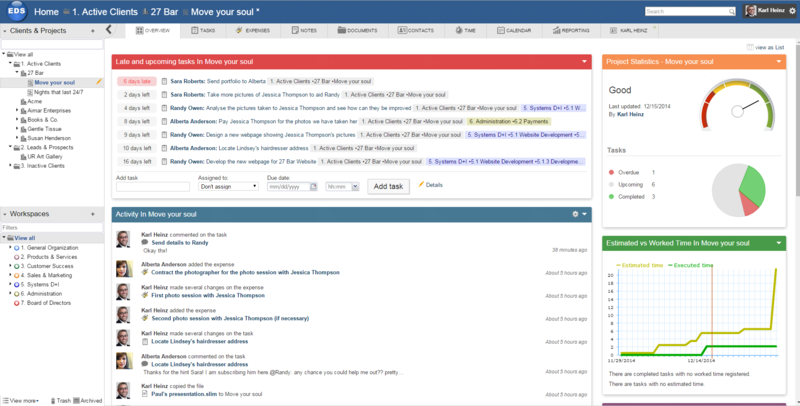 The Overview shows a summary of management information. It displays relevant information like: schedule of coming and current activities, running tasks, overdue and pending tasks, recently added or modified documents, latest messages, comments and conversations, e-mails, and more. 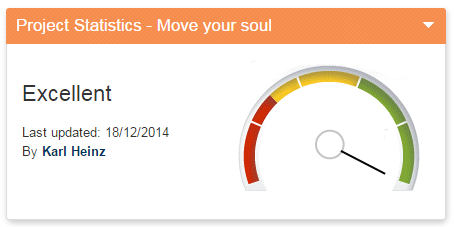 You can track every task, sub-task and milestone that is part of a service, project or activity. The system provides quick access to the tasks, grouped by state (pending, behind schedule and completed), priority, assigned person, and more. You can also define milestones for setting deadlines and improving project management. It is possible to automatically send an e-mail to notify a person who is assigned a task, or when there are any changes made to it. 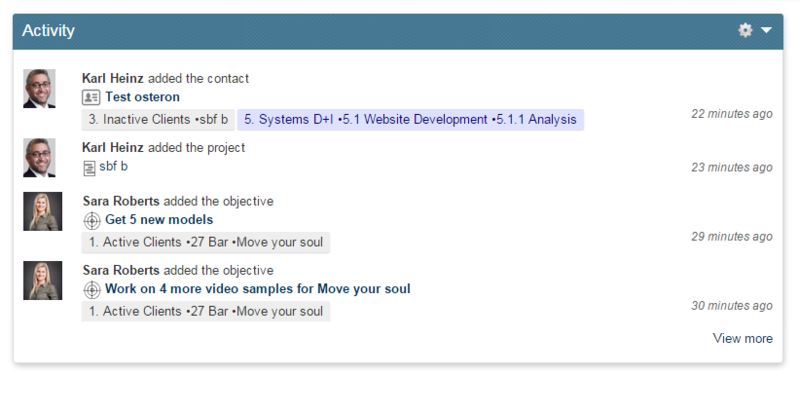 All the information linked to a specific task is available at a single click. 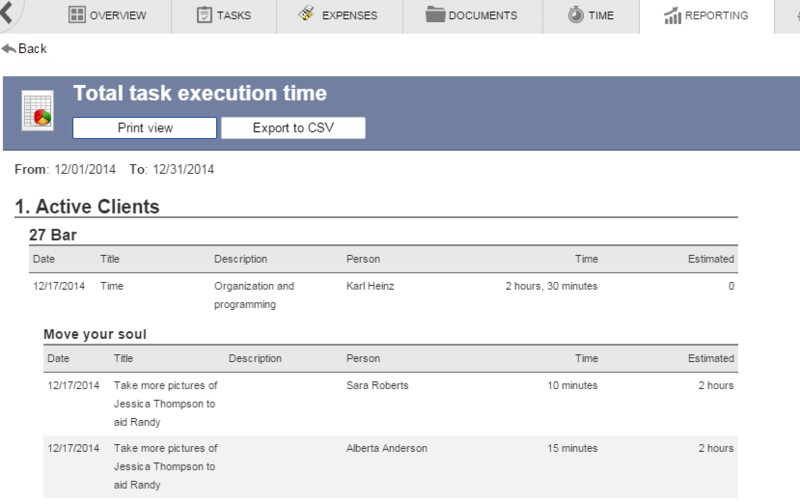 You can create a template out of a set of tasks and sub-tasks, improving the adoption of standard procedures. The calendar allows scheduling an agenda of events, milestones, tasks with deadlines, and meetings. It can be displayed daily, weekly or monthly. The schedule could be shared amongst the users who have correspondent privileges. You can see the schedule of events in general or specifically for each workspace or tag. Feng Office e-mail is a fully-functional, fully-integrated e-mail client. Like your traditional e-mail, but with the advantages of being inside Feng Office. Feng Office E-mail will come very natural to e-mail users, and will add some powerful features. Besides standard e-mail, users have the possibility of sharing the message with others by classifying it and subscribing others, treating the e-mail as an internal document. 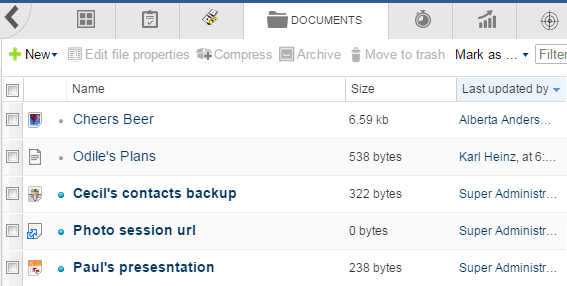 E-mail attachments are automatically stored as Documents. With the Professional Edition you can create rules to automate e-mail classification, and send group e-mails. Another nice feature is the ability to create a task out from an e-mail, with only a couple of clicks. Feng Office allows you to store and share all types of documents. The system keeps record of the different versions, comments, and a controlled access to optimize the work of people who collaborate on a document. Text documents and presentations can be created or edited directly in Feng Office without the requirement of any additional software in your computer. Workspaces allow individuals and teams to organize their data and tasks, and share them with other people. 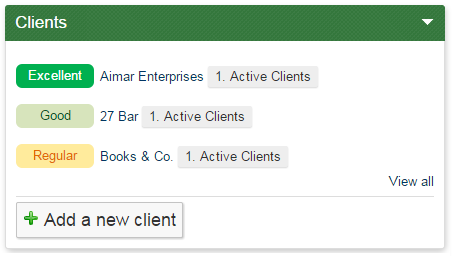 They can be linked to Clients, Projects, Products, Services, Departments, etc. You can define many levels and sub-levels of Workspaces. 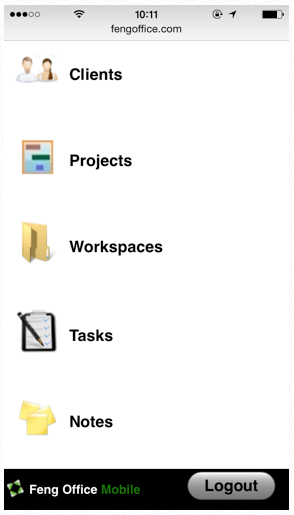 Visually identify your most relevant Workspaces, quickly, by assigning different color labels. Notes are an easy way to register and share comments over any piece of information. They are very useful for: tracking the conversations maintained with third parties, assessing the client satisfaction about quality, tracking a physical document, etc. A note could be entered by any user, and can notify others about it by e-mail. 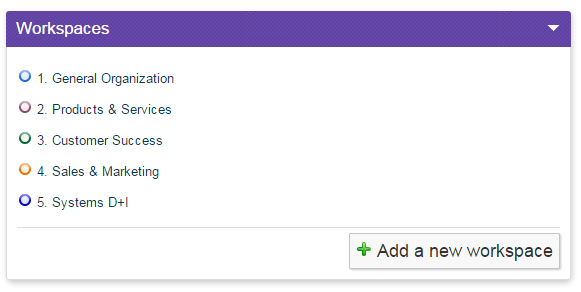 You can modify, register or create new users through the user panel. You can create and modify groups of users and group or individual permissions, making available only the relevant and corresponding information to each user. All the information managed by the system can be linked, assuring no element is forgotten or goes unnoticed. One document can have messages linked to it -or a meeting can have documents- and so with every element of the system, thus creating infinite data management possibilities.